First impressions are important when you present your business on the internet. You only have a few seconds to hook a potential customer who is browsing your site, and this first hook is visual appeal. Our Website Designing Services can give you the competitive edge that makes your Website stand out among the rest. Choosing the right web development partner can mean the difference between a wasted financial investment or incredible business success. We hope to emphasize our professional expertise through this Website. 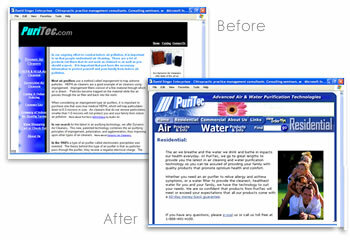 We transform obscure (wasted) websites into high visibility customer generating advertising machines. The best way to know whether we're suitable for you is to meet over a tea or coffee with us to discuss your needs. You can also start the ball rolling by sending us a message using our request quote - we'll get back to you promptly with a reply. Here's a list of ten common Website problems. If your site does some of these no-no's, you might want to consider getting it a touch-up, if not a facelift..
1. The site looks amateurish and/or parts are broken. Recent studies have shows that people form an opinion of a Website within the first three seconds of looking at it. If you're trying to sell a product or service, you should put your best foot forward. Your Website doesn't have to be a work of cutting-edge art, but it does need to look good. Remember, it's the first impression your business is making on the potential customer. 2. The site doesn't ask viewers to do something. If you're selling a product, you need to ask your viewers to click a link to buy the product. If you're selling a service, you need to ask your viewers to submit a form and contact you to get a free quote (or whatever). If your site is a free information resource, you need to ask your viewers to create an account in order to access the information. 3. The navigation links are confusingly named. Body text links can be longer than navigation links. Sometimes a whole sentence is a more effective body text link than a single word would be. 4. The information on the site is obviously dated. You can have a web developer create a CMS - "content publishing system" and integrate it with your site. This is the most expensive solution, costing several hundreds of dollars, but it's also the most customizable and easy to use. And you can use it from any computer--not just your own. 5. The pictures on the site aren't "optimized." You shouldn't just take your unadulterated digital camera or scanned pictures and post them online. You should first crop them, resize them smaller, color and level-balance them, and then optimize them for small file size. If your site is full of huge pictures that take forever to download and look bad once they do, forget about viewers sticking around or forming a great opinion of your offerings. 6. The body text is too dense. Reading text on a computer screen is harder on the eyes than reading from a piece of paper. The font shouldn't be too small or too large, and the typeface should be one that's easy to read on a screen. For maximum readability, blocks of body text should be 12 to 15 words long, and 3 to 5 lines long. What you're reading right now is set in sans-serif, which is a very common body text choice. "Style sheets" were also used so that the line-spacing is set a little higher than usual. The font size is based on your standard browser font size. Break up sections of text with headers. Headers are good because they allow people who "scan" web pages to quickly find what they're looking for. They're also great for search engine optimization of your key phrases. Headers should be in a different type style than your body text so it sticks out. Consider bold-facing the most important parts in each section of body text. This greatly helps people who scan web pages rather than read them. 7. The site is hosted on Geocities or another free service. There's nothing wrong with free hosting if your website is of a personal nature, but if your site is for your business, you need full-service (paid) hosting. 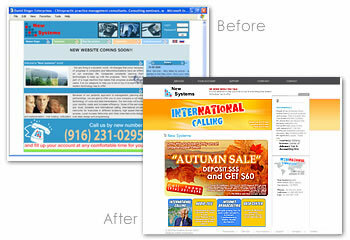 Free hosting generally puts other businesses' ad banners on top of your site, and is slow. Avoid it. Here's a great hosting. 8. The site is down or can't be found. If the problem isn't of a technical nature, then website marketing including search engine optimization and directory submissions can do wonders. So can links to your site from other sites. And don't forget classifieds, postcards, and email (but don't be a spammer). 9. There are navigation links at the bottom of the page but not at the top (or vice versa). The majority of the people who visit your website probably won't make the effort to scroll down to the bottom of your home page. Therefore, it's very important to have navigation links appear at the top of your site so they'll be visible to viewers without them having to do any scrolling. It's also a good idea to repeat your navigation links at the bottom of the page. These are usually done as text links rather than image links. These allow people who have reached the bottom of the page a way to get around your site without having to scroll back to the top of the page first. 10. The body text is too colorful and there are textured or picture backgrounds. The body text on your site should usually be black on a plain white background. Occasionally you can have other colors (if there's good contrast). If you have a texture or a picture behind your words, it makes the words hard to read. You should strive to make things as easy for your users as possible, so get rid of the textured or pictorial background or put it in areas where there's no foreground text. You can get the ball rolling by sending a message using our free quote request form. Our higly qualified professional will get back to you promptly with a reply.